TLRs are a major group of pattern recognition receptors that are crucial in initiating innate immune responses and are capable of recognizing Plasmodium ligands. We have investigated TLR responses during acute experimental P. falciparum (P.f.) infection in 15 malaria-naive volunteers. 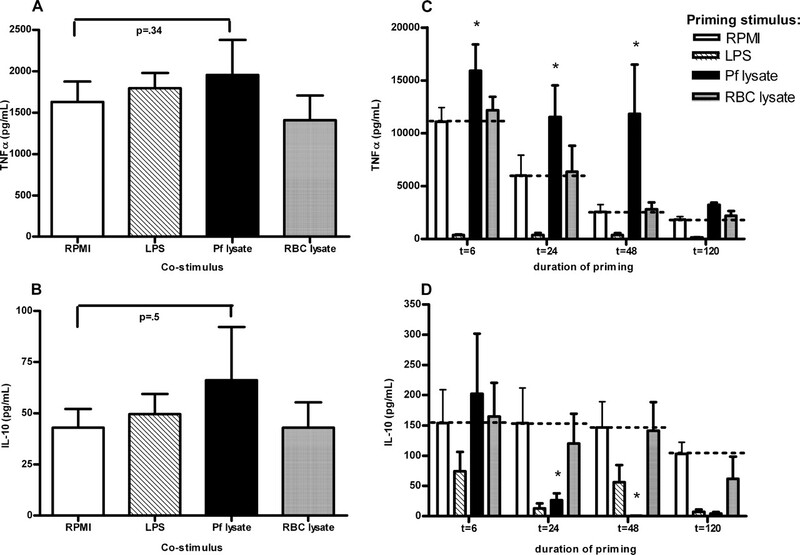 TLR-4 responses in whole blood ex vivo stimulations were characterized by significantly (p < 0.01) up-regulated proinflammatory cytokine production during infection compared with baseline, whereas TLR-2/TLR-1 responses demonstrated increases in both proinflammatory and anti-inflammatory cytokine production. Responses through other TLRs were less obviously modified by malaria infection. The degree to which proinflammatory TLR responses were boosted early in infection was partially prognostic of clinical inflammatory parameters during the subsequent clinical course. Although simultaneous costimulation of human PBMC with P.f. lysate and specific TLR stimuli in vitro did not induce synergistic effects on cytokine synthesis, PBMC started to respond to subsequent TLR-4 and TLR-2 stimulation with significantly (p < 0.05) increased TNF-α and reduced IL-10 production following increasing periods of preincubation with P.f. Ag. In contrast, preincubation with preparations derived from other parasitic, bacterial, and fungal pathogens strongly suppressed subsequent TLR responses. Taken together, P.f. primes human TLR responses toward a more proinflammatory cytokine profile both in vitro and in vivo, a characteristic exceptional among microorganisms. Clinical malaria is characterized by high levels of circulating proinflammatory cytokines, which are thought to contribute to the immunopathology of the disease. The balance between pro- and anti-inflammatory responses toward the parasite is considered critical for clinical protection. Too little immune activation results in uninhibited parasite growth, whereas too much activation may lead to immunopathology. The innate immune system initiates and thus sets the threshold of immune responses, yet we know little about how innate activation is regulated in malaria. TLRs are key receptors involved in the initial activation of the innate immune system (1, 2), which are capable of recognizing a wide range of microbial components, including bacterial LPS, lipopeptides, and glycolipids, unmethylated bacterial DNA, and viral nucleic acids (3). Plasmodium falciparum (P.f. )3-derived GPI moieties have long been known to induce potent TNF-α responses in macrophages (4), and recently it was shown that recognition of these membrane components from Plasmodium (5), as well as other parasites, including Trypanosoma (6) and Leishmania (7), is mediated by TLR-2 and to lesser extent TLR-4. TLR-9 was further shown to recognize P.f. hemozoin (8), a crystalline by-product of hemoglobin metabolism by malaria parasites, although more recently it has been suggested that in fact hemozoin-bound nucleic acids form the true ligand for this receptor (9). TLR and other immune signaling pathways may be subject to modulation by a variety of mechanisms, most commonly down-regulation following stimulation. Indeed, long before the discovery of TLRs, it was known that stimulation with endotoxin, now recognized to be the major ligand for TLR-4 (10), induces tolerance to restimulation, both in vitro and in vivo (11). Insight into how malaria infection affects innate immune responses is limited and most research in the past has focused on immune responses during the recovery phase of the disease (12, 13). In this study, we have used the unique opportunity provided by an experimental human malaria infection to study TLR responses during acute P.f. malaria in naive volunteers. The following TLR ligands were used: Pam3Cys and MALP2 (EMC Microcollections), polyI:C double-stranded RNA, Salmonella typhimurium flagellin and loxoribine (InvivoGen), CpG-unmethylated ODN (TIB MolBiol), and highly purified Escherichia coli LPS as described previously (14). Ag from E. coli (ATCC 35218), Staphylococcus aureus (ATCC 25923), Candida albicans (ATCC MYA 3573), and Mycobacterium tuberculosis (H37) was prepared by heat-killing. Schistosoma egg Ag was a gift from M. Yazdanbakhsh (Department of Parasitology, Leiden University Medical Centre, Leiden, The Netherlands). P. f. asexual blood stages of the NF54 strain were cultured in vitro as described previously (15). Briefly, parasites were grown in RPMI 1640 containing 10% human AB+ serum and a 5% hematocrit erythrocyte suspension in an automated continuous culture system. Parasites were cultured in the absence of antibiotics and regularly screened for mycoplasma contamination and other microorganisms. One- to 3-wk-old female Anopheles stephensi mosquitoes were membrane fed on cultures containing mature gametocytes and housed for 2 wk until sporozoites developed. Batches of mosquitoes with >95% sporozoite positivity were used to infect volunteers. For in vitro stimulation experiments, asynchronous cultures of NF54 strain parasites were harvested at a parasitemia of ∼10–20% and the mature asexual stages were purified by centrifugation on a 63% Percoll density gradient (16). This purification step results in preparations with 80–90% parasitemia, consisting of >95% schizonts/mature trophozoites. These preparations of parasitized RBC (pRBC) were washed twice in RPMI 1640 and used fresh in stimulation assays or freeze-thawed twice to obtain parasite lysate. Mock-cultured uninfected erythrocytes (uRBC) were obtained similarly and served as control. Fifteen healthy adult malaria-naive volunteers (5M, 10F; mean age 21.1yrs) underwent an experimental human malaria infection, similar to ones described previously (17). After passing an extensive screening consisting of history, physical examination and biochemical analyses and signing informed consent, volunteers were infected with P.f. by bites from five infected female A. stephensi mosquitoes (day 0). From day 4 onwards, the volunteers were followed-up twice-daily by study physicians until they became thick-smear positive (approximately day 9) and were then treated with a standard curative regimen of artemether-lumefantrine. Clinical parameters were recorded at each visit and venous blood was drawn for detection of submicroscopic parasitemia by QT-NASBA (18) and biochemical analysis, including C-reactive protein levels by ELISA (DakoCytomation); in addition volunteers kept a daily logbook of symptoms and were trained in the home use of a standardized tympanic thermometer. The study was approved by the Nijmegen University institutional review board (CMO 2004/129). Venous whole blood was collected from experimental human malaria volunteers on day −1, day 8 (during blood stage infection), and day 21 (∼1 wk after treatment) in endotoxin-free lithium-heparin tubes (BD Biosciences), diluted to a final concentration of 1/5 in RPMI 1640, and plated out at 1 ml/well in 24-well tissue culture plates. Stimulation was performed for 24 h with a range of highly purified TLR ligands in three 10-fold serial concentrations. Venous blood was collected in EDTA tubes from other malaria-naive donors and PBMC isolated by density centrifugation on Ficoll-Hypaque (Amersham Biosciences). PBMC were plated into 96-well cell culture plates at a final density of 106/ml in RPMI 1640 containing 1% glutamine, 1% pyruvate, 1% gentamicin, and 10% pooled human AB+ serum (Bodinko) and stimulated as indicated. In priming/restimulation experiments, cells were preincubated with the priming stimulus for the appointed duration, after which, plates were centrifuged (8 min × 1400 rpm), and culture supernatants were removed and replaced with fresh culture medium containing the secondary stimulus. IL-1β, IL-6, IL-10, and TNF-α in supernatants from whole blood stimulations were measured using the Luminex multiplex bead array system (Bio-Rad), lower detection limit 2 pg/ml, according to the manufacturer’s instructions. IL-6, IL-8, IL-10, and IFN-γ cytokine production in supernatants from PBMC experiments was measured by sandwich ELISA according to the manufacturer’s instructions (Sanquin), TNF-α as described previously (19). Following 24-h in vitro incubation with P.f. Ag or controls, PBMC were cooled to 4°C for 15 min to detach adherent monocytes and harvested into FACS tubes. The cells were washed twice in 0.5% BSA/PBS and incubated for 15 min in the presence of the following mAbs: TLR2-FITC, TLR4-PE, CD14-allophycocyanin (all from eBioscience). Cells were washed twice more in FACS buffer and analyzed on a FACSCalibur flow cytometer (BD Biosciences). Monocytes were gated on scatter characteristics and CD14 positivity. Statistical analysis was performed using SPSS 12.0 statistical software. Nonparametric tests were used to compare all paired (Wilcoxon signed rank test) cytokine responses; correlation analysis between ex vivo cytokine production and the clinical parameters temperature and C-reactive protein levels on and around the day of thick-smear positivity was performed using Spearman’s test; values of p < 0.05 were considered statistically significant in all analyses. In in vitro restimulation experiments, continued background cytokine production in primed but unrestimulated control cells was generally below or just around the lower ELISA detection limit (e.g., <100 pg/ml TNF-α, <5 pg/ml IL-10), except for cells primed with LPS or heat-killed bacteria, which continued to produce small amounts of cytokine (±500 pg/ml). In Figs. 3⇓ and 6⇓, these background values are explicitly shown; in all other figures, any detectable background was subtracted from the values shown. Unless otherwise indicated, all in vitro experiments were performed with PBMC from at least five malaria-naive volunteers, over at least two separate experiments. To investigate TLR responses during early P.f. infection, we undertook an experimental human malaria infection and measured whole blood responses to a panel of specific TLR ligands before (day −1), during (day 8), and after infection (day 21). The clinical course in our study volunteers was typical for experimental human malaria (17). All 15 volunteers developed patent parasitemia, as determined by thick-smear microscopy, after a mean of 9.9 days (range: 7.5–11.5) (Fig. 1⇓A). By day 8, most volunteers had developed some symptoms attributable to malaria (mainly headache and fatigue), but no overt signs except for slightly elevated tympanic temperature: (mean 37.9°C, range: 37.0–39.4°C) (Fig. 1⇓B). All but one of the volunteers were shown retrospectively to be harboring submicroscopic parasitemia by day 8 or earlier (Fig. 1⇓C). Two of the 15 volunteers were excluded from day 8 analyses because they had started treatment before the day 8 measurements. Clinical course of experimental malaria in human volunteers. A, Typical course of infection in a volunteer. Horizontal error bar represents actual range of start of treatment among volunteers in this study. Thick arrows represent measurement points (WBA, whole blood assay). B, Temperature curve in volunteers during infection. Data represent the mean of the highest recorded temperature per volunteer on each day. C, Mean parasitemia in volunteers as measured by quantitative nucleic acid sequence-based amplification (QT-NASBA). Dotted line represents approximate detection limit by thick smear. Responses to the TLR-4 ligand LPS showed the most consistent changes during malaria infection, with increased production of the proinflammatory cytokines TNF-α, IL-1β, and IL-6 (Fig. 2⇓A), but no significant change in IL-10 response. The TNF-α/IL-10 ratio was thus significantly elevated during infection (1.91 (range 1.16–6.37) on day 8 vs 0.94 (0.33–3.29) on day −1, p = 0.011). Responses to the TLR-9 ligand CpG DNA were generally low at all time points, without significant changes during infection (Fig. 2⇓B). Because the low TNF-α and IL-1β responses to CpG (<30 pg/ml) hindered meaningful analysis, we measured IL-8 in these samples as an additional marker of inflammatory response. Although marked changes were seen in some individual volunteers during infection, within the group as whole there was no significant increase in response (Fig. 2⇓B). TLR-2 responses displayed a more heterogeneous pattern during infection. 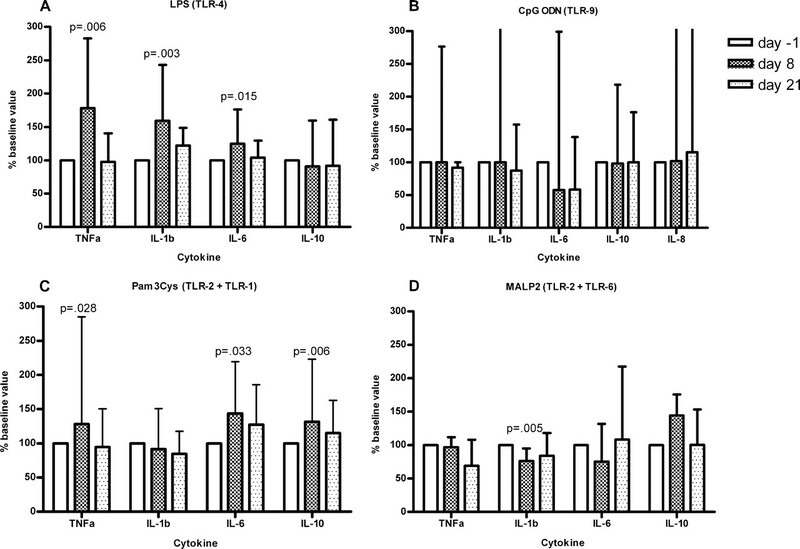 Pam3Cys, a ligand recognized by TLR-2/TLR-1 heterodimers, induced higher production of TNF-α and IL-6, but also of the anti-inflammatory cytokine IL-10 (Fig. 2⇓C). Responses to MALP2, a ligand for TLR-2/TLR-6 heterodimers, were marked by lower IL-1β production, but no other significant changes during infection (Fig. 2⇓D). Responses to polyI:C (TLR-3) and loxoribine (TLR-7) did not show any significant changes during malaria infection (data not shown). By day 21, responses to most TLR ligands had returned to baseline levels (Fig. 2⇓). Thus, there is distinct modulation of individual TLR responses during acute P.f. infection. 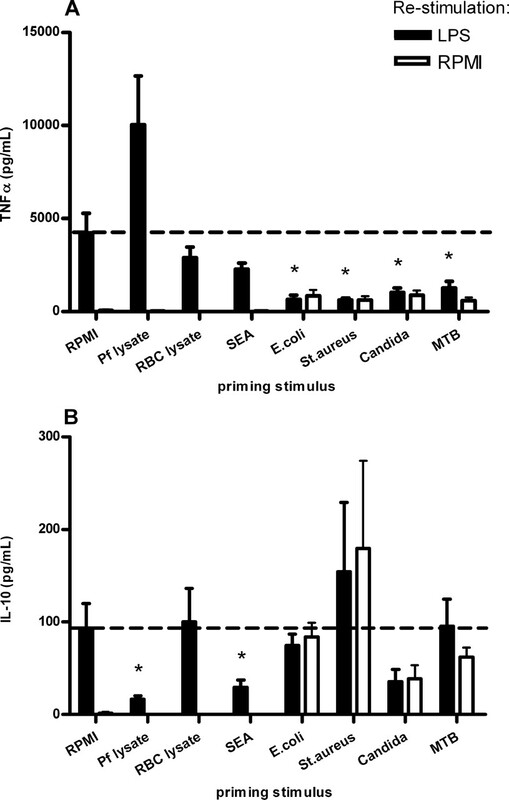 TLR-induced cytokine responses in whole blood of individuals infected experimentally with P.f. 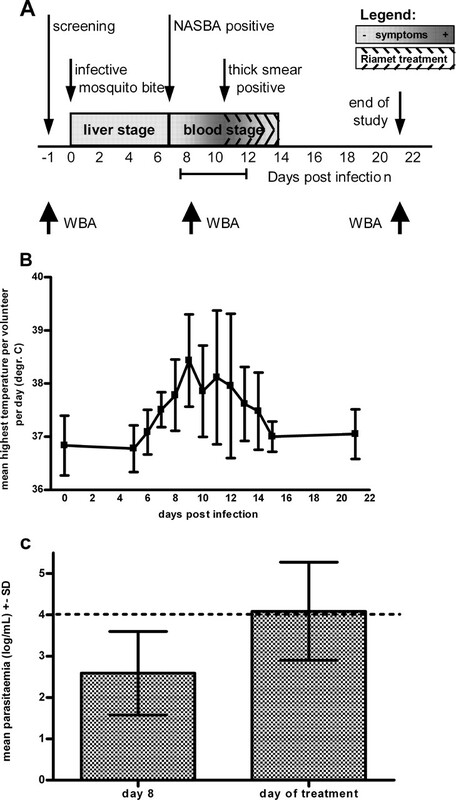 Whole blood drawn before infectious mosquito bite (day −1, □), during blood-stage parasitemia (day 8, dark gray) and 1 wk posttreatment (day 21, light gray), was stimulated for 24 h with 10 ng/ml LPS (A), 10 μg/ml CpG ODN (B), 10 μg/ml Pam3Cys (C), or 10 μg/ml MALP2 (D). Cytokine production is expressed as a percentage of baseline (day −1) values per volunteer. All stimulations were performed with two other 10-fold different concentrations of TLR ligand, with similar results. Data represent median values from 15 volunteers ± interquartile range. Values of p by Wilcoxon. Median (interquartile range) day −1 values for TNF-α, IL-1β, IL-6, and IL-10 were, respectively, 759 (421–947), 951 (838–1,340), 11,200 (8,820–16,200) and 959 (614–1,060) pg/ml against LPS; 33 (9–77), 48 (7–81), 3,880 (872–6210) and 156 (69–234) pg/ml against Pam3Cys; 20 (8–29), 41 (7–69), 1,774 (1,070–4,520) and 81 (62–125) pg/ml against MALP2; 3 (<2–5), 6 (<2–11), 115 (21–540) and 4 (<2–9) pg/ml against CpG DNA (IL-8: 484 (200–3,070) pg/ml); <2 (<2), <2 (<2), 4 (<2–14) and 2 (<2–3) pg/ml for RPMI 1640 control (data not shown). Lower detection limit <2 pg/ml. No significant correlation was found between any individual cytokine responses to TLR ligands at baseline and the clinical parameters fever or C-reactive protein levels in the study volunteers. However, the extent of TLR priming, i.e., the ratio of TLR responses on day 8 relative to day 0 values, did correlate with these clinical parameters. Priming of the TNF-α response to LPS correlated positively with maximum C-reactive protein levels per volunteer (R2 0.63, p = 0.028), as did the increase in TNF-α/IL-10 ratios (R2 0.71, p = 0.01). TNF-α responses to CpG DNA were too low to measure reliably, but relative priming of the IL-6 response to CpG correlated strongly with the highest recorded temperature per volunteer (R2 0.89, p < 0.001). Thus, although an individual’s baseline TLR reactivity did not predispose to inflammatory manifestations of malaria, the extent to which these responses were primed early during infection, correlated to an extent with clinical signs of inflammation later in the course of disease. To further investigate the modulation of TLR responses by P.f., we studied this phenomenon in vitro by preincubating PBMC with P.f. 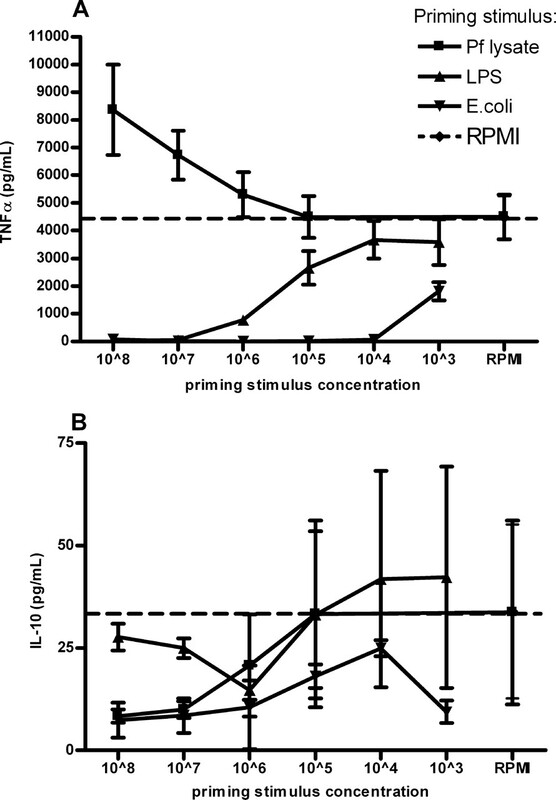 lysate or controls and measuring the response to subsequent LPS stimulation (Fig. 3⇓A). As expected from previous endotoxin studies (20), PBMC primed with 1 ng/ml LPS no longer responded to restimulation with additional LPS, although these cells did demonstrate some background cytokine production, particularly IL-10. Following priming with crude P.f. Ag in contrast, TNF-α responses to LPS were boosted. This elevated TNF-α production did not represent a continued response to P.f. Ag itself, because little to no cytokine was produced by P.f.-primed cells restimulated with RPMI 1640 only. Interestingly, priming with P.f. Ag led to a reciprocal decrease in the IL-10 response to LPS (Fig. 3⇓B), resulting overall in a markedly more proinflammatory innate immune response. Responses to LPS were not affected by preincubation with lysate of mock-cultured uninfected RBC (Fig. 3⇓). Live P.f.-infected RBC induced a similar degree of priming to LPS as pRBC lysate did (data not shown). Thus also in vitro, P.f. Ag primes PBMC to respond in more proinflammatory way to subsequent TLR-4 stimulation. Such priming was seen in all donors (n > 20) we have tested so far. LPS-induced cytokine responses in PBMC after P.f. or LPS preincubation in vitro. PBMC from malaria-naive donors were preincubated with P.f. lysate corresponding with 5 × 106 pRBC/ml, mock-cultured RBC lysate, RPMI 1640, or 1 ng/ml LPS. After 24 h, culture supernatants were discarded and cells restimulated for 6 h with 1 ng/ml LPS (▪) or RPMI 1640 only (□) and cytokine production measured (A, TNF-α; B, IL-10). Data represents mean values ± SEM from eight donors in four separate experiments; ∗, p < 0.05 (Wilcoxon). The proinflammatory priming effect of P.f. Ag in vitro was not limited to TLR-4 responses. 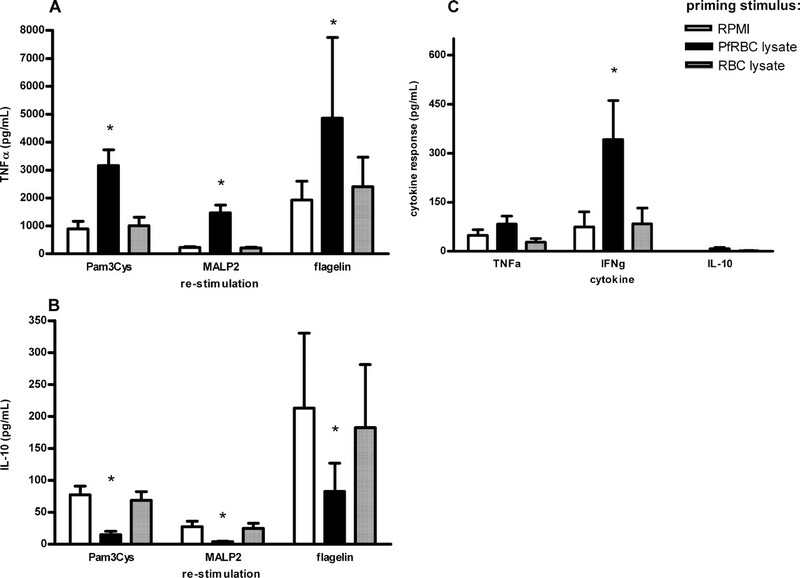 Similar effects were observed on responses to the TLR-2/TLR-1 ligand Pam3Cys, the TLR-2/TLR-6 ligand MALP2 and the TLR-5 ligand flagellin (Fig. 4⇓, A and B). Restimulation with the TLR-3 ligand polyI:C, the TLR-7/TLR-8 ligand loxoribine and the TLR-9 ligand CpG ODN did not result in measurable TNF-α or IL-10 production by PBMC, either with or without preincubation with P.f. Ag (data not shown). Cytokine responses to other stimuli following preincubation with P.f. Ag. A and B, PBMC were preincubated for 24 h with either RPMI 1640 only (□), P.f. lysate (▪), or RBC lysate (▦), following which supernatants were discarded and cells restimulated for 6 h with 1 μg/ml Pam3Cys, 1 μg/ml MALP2, or 10 μg/ml flagellin (A, TNF-α; B, IL-10). C, PBMC were preincubated as above, then restimulated for 24 h with 5 × 106 live pRBC. Data represent mean values ± SEM of five or six donors in at least two experiments. ∗, p < 0.05 for Pf-primed vs both RBC- and RPMI 1640-primed cells. Next, we investigated whether preincubation with parasite Ag also modified responses to restimulation with whole microorganisms. Following preincubation with P.f., PBMC responded to heat-killed E. coli in a more proinflammatory manner, in accordance with the high LPS content of this Gram-negative bacterium (data not shown). Responses to restimulation with P.f. itself demonstrated a similar pattern. Although TNF-α responses to restimulation with live pRBC were generally low in absolute terms (Fig. 4⇑C), the production of IFN-γ, a stronger marker of the proinflammatory immune response by PBMC to P.f. (21, 22), was clearly increased following priming. Thus, priming by P.f. Ag in vitro is a phenomenon that affects not only multiple TLRs but also responses to whole microorganisms, including asexual P.f. parasites themselves. We investigated whether priming by P.f. Ag simply represents a synergistic effect of two simultaneous stimuli. However, no synergy was found when PBMC were stimulated simultaneously with LPS and P.f. Ag (Fig. 5⇓, A and B). Instead, a period of preincubation with P.f. Ag was required to induce proinflammatory priming of TLR responses by PBMC. Such priming was first seen after 6 h of preincubation with P.f. Ag, but required up to 48 h to develop maximally (Fig. 5⇓C). In contrast, the TLR-4 tolerance induced by LPS itself was reached fully within 6 h. Some proinflammatory effect on TLR-4 responses was still seen after up to 120 h of preincubation with P.f. Ag, indicating that even over longer time periods P.f. does not induce TLR tolerance. The temporal pattern of TNF-α priming was mirrored by a decrease in IL-10 responses (Fig. 5⇓D). A similar time course was seen for TLR-2 responses (data not shown). Cytokine response to LPS following simultaneous costimulation with P.f. or preincubation for increasing time periods. A and B, PBMC were simultaneously costimulated for 6 h with 1 ng/ml LPS and either RPMI 1640 only (□), an additional 1 ng/ml LPS (shaded bars), P.f. lysate (▪), or RBC lysate (▦) (A, TNF-α; B, IL-10). C and D, PBMC were preincubated for 6, 24, 48, or 120 h with either RPMI 1640 only, LPS, P.f. lysate, or RBC lysate, following which supernatants were discarded and cells restimulated for 6 h with 1 ng/ml LPS (C, TNF-α; D, IL-10). All data represent mean values ± SEM of the same five donors in two separate experiments; ∗, p < 0.05 for P.f.-primed vs unprimed cells (Wilcoxon). To discover whether priming of innate immune responses is a ubiquitous feature of microorganisms, we used extracts of a panel of common human pathogens. 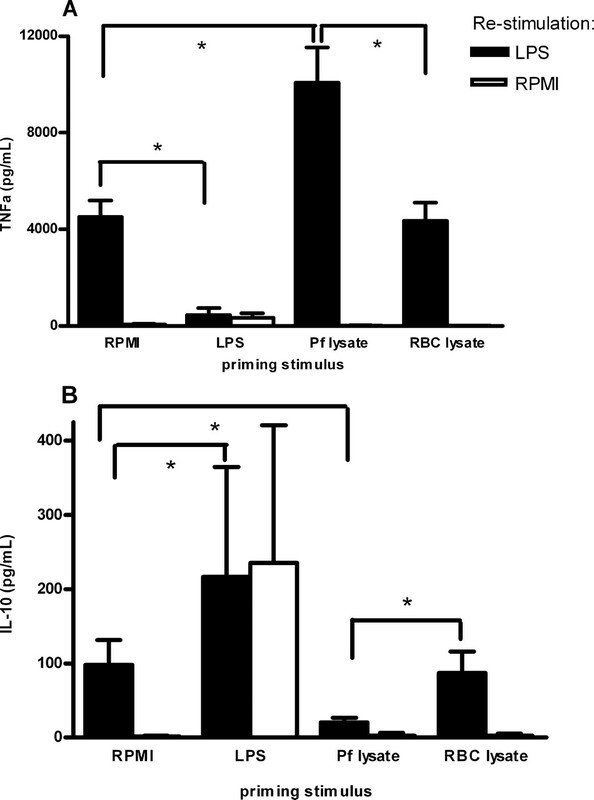 The proinflammatory effect on TLR responses appeared to be a unique characteristic of Plasmodium parasites, because preincubation of PBMC with extracts of a range of bacterial, fungal, and parasitic microorganisms induced tolerance to subsequent TLR stimulation (Fig. 6⇓). The only exception was a slight priming of TLR-2 (Pam3Cys) responses by soluble egg Ag of S. mansoni, which may represent part of the pathway toward the Th2-type responses known to be induced by this pathogen (23) (data not shown). LPS-induced cytokine responses by PBMC after preincubation with a panel of human pathogenic microorganisms. PBMC were preincubated with either RPMI 1640 only, crude P.f. Ag, uRBC lysate, 5 mg/ml Schistosoma egg Ag, 107 CFU/ml heat-killed E. coli, 107 CFU/ml heat-killed S. aureus, 107 CFU/ml heat-killed C. albicans, or 5 mg/ml crude MTB Ag. After 24 h, supernatants were discarded and cells restimulated for 6 h with 1 ng/ml LPS (▪) or RPMI 1640 only (□). Data represent mean values of five donors in two separate experiments (A, TNF-α; B, IL-10); ∗, p < 0.05 vs unprimed cells (Wilcoxon). Because P.f. Ag induced relatively weak primary responses by PBMC compared with LPS or other microorganisms, we asked whether P.f.-induced priming might be a dose-dependent phenomenon. Priming by P.f. Ag was found across a wide range of Ag concentrations and the level of priming was correlated positively with Ag concentration. In contrast, responses to restimulation with LPS following preincubation with either LPS or heat-killed E. coli Ag remained suppressed across a range of concentrations, indicating that priming was not simply a ubiquitous consequence of low-level stimulation (Fig. 7⇓). Similar results were obtained in dilution experiments with the TLR-2 ligand Pam3Cys and heat-killed S. aureus Ag (data not shown). LPS-induced responses by PBMC after preincubation with a concentration range of different Ags. PBMC were preincubated with 10-fold serial dilutions of crude P.f. Ag (▪), LPS (▴), heat-killed E. coli Ag (▾), or a RPMI 1640 control (♦ and dotted line). Highest concentrations represent 5 × 107 NF54 pRBC/ml, 100 ng LPS/ml, and 5 × 107 CFU/ml, respectively. After 24 h, supernatants were discarded and cells restimulated for 6 h with 1 ng/ml LPS. Data represent mean values ± SEM of four donors (A, TNF-α; B, IL-10). Finally, we measured TLR-expression on monocytes by flow cytometry to discover whether P.f. Ag causes an up-regulation of these receptors. Following incubation for 24 h with either LPS or Pam3Cys in vitro, TLR expression on monocytes demonstrated typical changes (24, 25), with lower TLR-4 and higher TLR-2 (Table I⇓). Following similar incubation with P.f. Ag, however, no change in TLR-expression was seen. Thus the priming effect of P.f. on TLR responses is not mediated through an increased expression of these receptors. Using an experimental human malaria model, we have shown for the first time that TLR responses are individually modulated during acute P.f. infection, with TLR-4 signaling in particular primed toward a more proinflammatory response and TLR-2/TLR-1 responses demonstrating an increase in both pro- and anti-inflammatory cytokines. In contrast, responses through other TLRs did not change appreciably. In vitro we demonstrate that this proinflammatory priming of TLR responses involves more than simple synergy because the priming effect of P.f. requires up to 48 h to develop maximally. Furthermore, we find that priming is a unique characteristic of P.f. among a panel of common human pathogens. Our data complement a recent microarray analysis of both experimentally infected volunteers and naturally infected malaria patients, which suggests an up-regulation of inflammatory pathways during early malaria infection (26). Although lacking functional data and limited by uncertainty over the precise cellular source, the report clearly demonstrates an up-regulation of PBMC mRNA transcripts coding for various components of both innate and adaptive inflammatory pathways, including a number of TLRs, MyD88, NF-κB, and IFN-γ, during presymptomatic infection. Furthermore, whereas the authors found that IL-10-mediated anti-inflammatory pathways were up-regulated in the clinical malaria patients, they were notably absent in their presymptomatic volunteers, supporting the proinflammatory bias early during infection. Interestingly, whereas transcripts of TLR-4, TLR-2, and TLR-1 (the coreceptor for the ligand Pam3Cys) were up-regulated during malaria, TLR-6 (coreceptor for MALP2) was not, which follows the pattern of our ex vivo TLR responses. Others have previously suggested that malaria primarily has a suppressive effect on TLR signaling, possibly through cross-tolerance following recognition of Plasmodium Ags by TLRs (27). Supportive data come primarily from historical studies involving Plasmodium vivax infections used therapeutically for (neuro) syphilis (12, 28) in which patients or volunteers demonstrated suppressed clinical responses to respectively typhoid vaccination and injected endotoxin following malaria infection. In addition, a more recent study in a Plasmodium yoelii murine malaria model found that dendritic cell responses to TLR stimulation become significantly more anti-inflammatory by day 17 post infection, but not by day 3 (13). A possible explanation for these discrepancies is that these latter studies measured responses following the peak of malaria-induced inflammation. The classic human studies recorded diminished endotoxin responses during recovery from clinical malaria, i.e., following the peak pyretic response. This fits with the well-known phenomenon that ex vivo responses to stimulation are depressed following situations of immunological stress, including sepsis (29) and surgery (30). It may be that TLR tolerance is a ubiquitous phenomenon following overactivation of the immune system. In one of the above P. vivax studies, for example, all four of the volunteers who had developed malarial fever, but only one of the four infected volunteers without fever, subsequently manifested endotoxin tolerance; of the other three, one in fact had an increased endotoxin response (12). Diminished endotoxin responses in this study may also have been secondary to chloroquine, known for its anti-inflammatory properties, because all measurements were performed within a week of initiating therapy, well within the half-life of this drug (31). It may therefore be that malaria infection has a biphasic influence on the innate immune system, initially inducing priming but later suppression. This theory is supported by to a certain extent by the previously mentioned murine study, in which dendritic cell responses to TLR stimulation were found to become anti-inflammatory only during the postacute phase of malaria (13), and by the microarray paper, in which IL-10 mediated anti-inflammatory pathways were up-regulated only in clinical malaria patients but not presymptomatic volunteers (26). Although biphasic responses are common to homeostasis in general, to our knowledge no other example of early proinflammatory priming of human innate responses in vivo has been published; indeed, following experimental human endotoxemia, a clinical model in which TLR responses have been most extensively studied, induction of TLR tolerance occurs within hours of challenge, without any antecedent priming (P. Pickkers, unpublished observations). Whereas it is helpful that innate responses automatically down-regulate following immune overactivation, it might prove clinically beneficial to prevent this pathological state in the first place, e.g., through GPI vaccination (32), or at least ameliorate it through early targeted pharmacological modulation of TLR responses. In this last regard, we have noted that the level of proinflammatory TLR priming induced by malaria among our volunteers by day 8 (early infection) correlates with clinical inflammatory parameters such as fever and C-reactive protein levels during later stages of infection. Because many other protozoan (33, 34, 35) and filarial (36, 37) parasites can induce TLR suppression, it has been suggested that induction of TLR inhibitory pathways, originally evolved as a homeostatic mechanism to protect against overstimulation of the immune system (38), forms a common strategy by pathogens toward immune evasion (39). To our knowledge, only one other example of proinflammatory priming by a microorganism exists in the literature, although in this Propionibacterium (Corynebacterium) model (40, 41) only TLR-4, not TLR-2, pathways are effected in vivo, whereas in vitro all TLR responses are suppressed (42). Priming of TLR responses, both in vivo and in vitro, is also known to occur following tissue injury (43). Various new questions thus arise from our finding, including the molecular and cellular mechanisms by which P.f. Ag induces priming. Although it is as yet unclear which component of P.f. Ag causing proinflammatory priming, it is tempting to speculate that one of the defined P.f.-derived TLR ligands, i.e., either GPI moieties or hemozoin-bound nucleic acids, are involved. In this regard, our preliminary data suggest that priming can be caused by both soluble and insoluble parasite components, suggesting both ligands may play a role. Modulation of TLR-responses in endotoxin tolerance has been associated with changes in both cell surface TLR expression and intracellular signal transduction pathways (44, 45). We therefore performed measurements of TLR expression by flow cytometry to see whether TLR priming by Plasmodium was associated with changes in receptor abundance; however, TLR-2 and TLR-4 expression on monocytes were not altered following preincubation with P.f. in vitro. It remains to be proven whether modulation of downstream intra- and intercellular signaling pathways are involved. In the Propionibacterium model, for example, TLR-9-mediated production of IFN-γ and IL-12 is required to induce priming (46). We further propose that it is monocytes/macrophages that are the likely targets of P.f.-mediated priming. These cells form the majority of APCs in PBMC populations, can directly recognize and phagocytose parasites (47), are crucial in supporting the IFN-γ response by NK cells to pRBC (48), and are capable of rapid direct cytokine responses to TLR ligands (i.e., within the 6-h timeframe of our in vitro restimulation assays). Another question relates to which secondary stimulus—following priming of TLR pathways by pRBC—actually triggers the excessive inflammatory response seen in clinical malaria. The prime candidates are of course Plasmodium parasites or parasite derived Ags, which are known to form ligands for TLRs (5, 8). Indeed, we show here that priming by P.f. Ag in vitro boosts subsequent PBMC responses to live parasites. However, the role of other coincidental triggers in malaria patients cannot be excluded. We have found that responses to other pathogens, such as heat-killed E. coli, are equally well primed by pRBC. Furthermore, it is known that mucosal barriers can become leaky during malaria infection (49), exposing the immune system to intestinal flora, and, indeed, nontyphoidal Salmonella bacteremia is commonly associated with parasitemia (50), although its effect on clinical outcome may be limited (51). In summary, P.f. primes human TLR responses toward a more proinflammatory cytokine profile, a characteristic exceptional among microorganisms, a finding which may shed new light on the pathogenesis of this serious disease. Foremost, we thank all the volunteers who participated in the experimental human malaria infection. We are indebted to Marga van de Vegte and Henry Witteveen for the culture of P.f. parasites and to Geert-Jan van Gemert for the generation of infected mosquitoes. ↵1 This experimental human malaria study was supported by a grant from the DioRaphte Foundation. M.B.B.M. is supported by a FP6 European Network of Excellence (BioMalPar) fellowship. M.G.N. is supported by a VIDI Grant from the Netherlands Organization for Scientific Research. ↵3 Abbreviations used in this paper: P.f., Plasmodium falciparum; pRBC, parasitized RBC; uRBC, uninfected RBC; QT-NASBA, quantitative nucleic acid sequence-based amplification. Hopkins, P. A., S. Sriskandan. 2005. Mammalian Toll-like receptors: to immunity and beyond. Clin. Exp. Immunol. 140: 395-407. Schofield, L., F. Hackett. 1993. Signal transduction in host cells by a glycosylphosphatidylinositol toxin of malaria parasites. J. Exp. Med. 177: 145-153. Ropert, C., L. R. Ferreira, M. A. Campos, D. O. Procopio, L. R. Travassos, M. A. Ferguson, L. F. Reis, M. M. Teixeira, I. C. Almeida, R. T. Gazzinelli. 2002. Macrophage signaling by glycosylphosphatidylinositol-anchored mucin-like glycoproteins derived from Trypanosoma cruzi trypomastigotes. Microbes Infect. 4: 1015-1025. Becker, I., N. Salaiza, M. Aguirre, J. Delgado, N. Carrillo-Carrasco, L. G. Kobeh, A. Ruiz, R. Cervantes, A. P. Torres, N. Cabrera, et al 2003. Leishmania lipophosphoglycan (LPG) activates NK cells through toll-like receptor-2. Mol. Biochem. Parasitol. 130: 65-74. Parroche, P., F. N. Lauw, N. Goutagny, E. Latz, B. G. Monks, A. Visintin, K. A. Halmen, M. Lamphier, M. Olivier, D. C. Bartholomeu, et al 2007. From the cover: malaria hemozoin is immunologically inert but radically enhances innate responses by presenting malaria DNA to Toll-like receptor 9. Proc. Natl. Acad. Sci. USA 104: 1919-1924. Chow, J. C., D. W. Young, D. T. Golenbock, W. J. Christ, F. Gusovsky. 1999. Toll-like receptor-4 mediates lipopolysaccharide-induced signal transduction. J. Biol. Chem. 274: 10689-10692. Beeson, P. B.. 1946. Development of tolerance to typhoid bacterial pyrogen and its abolition by reticulo-endothelial blockade. Proc. Soc. Exp. Biol. Med. 61: 248-250. Rubenstein, M., J. H. Mulholland, G. M. Jeffery, S. M. Wolff. 1965. Malaria induced endotoxin tolerance. Proc. Soc. Exp. Biol. Med. 118: 283-287. Manthey, C. L., P. Y. Perera, B. E. Henricson, T. A. Hamilton, N. Qureshi, S. N. Vogel. 1994. Endotoxin-induced early gene expression in C3H/HeJ (Lpsd) macrophages. J. Immunol. 153: 2653-2663. Ponnudurai, T., A. H. Lensen, G. J. Van Gemert, M. P. Bensink, M. Bolmer, J. H. Meuwissen. 1989. Infectivity of cultured Plasmodium falciparum gametocytes to mosquitoes. Parasitology 98: 165-173. Rivadeneira, E. M., M. Wasserman, C. T. Espinal. 1983. Separation and concentration of schizonts of Plasmodium falciparum by Percoll gradients. J. Protozool. 30: 367-370. Verhage, D. F., D. S. Telgt, J. T. Bousema, C. C. Hermsen, G. J. van Gemert, J. W. van der Meer, R. W. Sauerwein. 2005. Clinical outcome of experimental human malaria induced by Plasmodium falciparum-infected mosquitoes. Neth. J. Med. 63: 52-58. Schneider, P., L. Wolters, G. Schoone, H. Schallig, P. Sillekens, R. Hermsen, R. Sauerwein. 2005. Real-time nucleic acid sequence-based amplification is more convenient than real-time PCR for quantification of Plasmodium falciparum. J. Clin. Microbiol. 43: 402-405. Grebenchtchikov, N., J. van der Ven-Jongekrijg, G. J. Pesman, A. Geurts-Moespot, J. W. van der Meer, F. C. Sweep. 2005. Development of a sensitive ELISA for the quantification of human tumour necrosis factor α using 4 polyclonal antibodies. Eur. Cytokine Netw. 16: 215-222. Dalpke, A., K. Heeg. 2002. Signal integration following Toll-like receptor triggering. Crit. Rev. Immunol. 22: 217-250.
van der Kleij, D., E. Latz, J. F. Brouwers, Y. C. Kruize, M. Schmitz, E. A. Kurt-Jones, T. Espevik, E. C. de Jong, M. L. Kapsenberg, D. T. Golenbock, et al 2002. A novel host-parasite lipid cross-talk: schistosomal lyso-phosphatidylserine activates Toll-like receptor 2 and affects immune polarization. J. Biol. Chem. 277: 48122-48129. Liu, Y., Y. Wang, M. Yamakuchi, S. Isowaki, E. Nagata, Y. Kanmura, I. Kitajima, I. Maruyama. 2001. Upregulation of Toll-like receptor 2 gene expression in macrophage response to peptidoglycan and high concentration of lipopolysaccharide is involved in NF-κb activation. Infect. Immun. 69: 2788-2796. Nomura, F., S. Akashi, Y. Sakao, S. Sato, T. Kawai, M. Matsumoto, K. Nakanishi, M. Kimoto, K. Miyake, K. Takeda, S. Akira. 2000. Cutting edge: endotoxin tolerance in mouse peritoneal macrophages correlates with down-regulation of surface Toll-like receptor 4 expression. J. Immunol. 164: 3476-3479. Ockenhouse, C. F., W. C. Hu, K. E. Kester, J. F. Cummings, A. Stewart, D. G. Heppner, A. E. Jedlicka, A. L. Scott, N. D. Wolfe, M. Vahey, D. S. Burke. 2006. Common and divergent immune response signaling pathways discovered in peripheral blood mononuclear cell gene expression patterns in presymptomatic and clinically apparent malaria. Infect. Immun. 74: 5561-5573. Boutlis, C. S., T. W. Yeo, N. M. Anstey. 2006. Malaria tolerance: for whom the cell tolls?. Trends Parasitol. 22: 371-377. Heyman, A., P. B. Beeson. 1949. Influence of various disease states upon the febrile responses to intravenous injection of typhoid bacterial pyrogen: with particular reference to malaria and cirrhosis of the liver. J. Lab. Clin. Med. 34: 1400-1403. Calvano, J. E., D. M. Agnese, J. Y. Um, M. Goshima, R. Singhal, S. M. Coyle, M. T. Reddell, A. Kumar, S. E. Calvano, S. F. Lowry. 2003. Modulation of the lipopolysaccharide receptor complex (CD14, TLR4, MD-2) and Toll-like receptor 2 in systemic inflammatory response syndrome-positive patients with and without infection: relationship to tolerance. Shock 20: 415-419. Kumpf, O., L. Hamann, P. M. Schlag, R. R. Schumann. 2006. Pre- and postoperative cytokine release after in vitro whole blood lipopolysaccharide stimulation and frequent Toll-like receptor 4 polymorphisms. Shock 25: 123-128. Gustafsson, L. L., O. Walker, G. Alvan, B. Beermann, F. Estevez, L. Gleisner, B. Lindstrom, F. Sjoqvist. 1983. Disposition of chloroquine in man after single intravenous and oral doses. Br. J. Clin. Pharmacol. 15: 471-479. Schofield, L., M. C. Hewitt, K. Evans, M. A. Siomos, P. H. Seeberger. 2002. Synthetic GPI as a candidate anti-toxic vaccine in a model of malaria. Nature 418: 785-789. Butcher, B. A., L. Kim, P. F. Johnson, E. Y. Denkers. 2001. Toxoplasma gondii tachyzoites inhibit proinflammatory cytokine induction in infected macrophages by preventing nuclear translocation of the transcription factor NF-κB. J. Immunol. 167: 2193-2201. Weinheber, N., M. Wolfram, D. Harbecke, T. Aebischer. 1998. Phagocytosis of Leishmania mexicana amastigotes by macrophages leads to a sustained suppression of IL-12 production. Eur. J. Immunol. 28: 2467-2477. Ropert, C., M. Closel, A. C. Chaves, R. T. Gazzinelli. 2003. Inhibition of a p38/stress-activated protein kinase-2-dependent phosphatase restores function of IL-1 receptor-associate kinase-1 and reverses Toll-like receptor 2- and 4-dependent tolerance of macrophages. J. Immunol. 171: 1456-1465. Babu, S., C. P. Blauvelt, V. Kumaraswami, T. B. Nutman. 2005. Diminished expression and function of TLR in lymphatic filariasis: a novel mechanism of immune dysregulation. J. Immunol. 175: 1170-1176. Goodridge, H. S., F. A. Marshall, K. J. Else, K. M. Houston, C. Egan, L. Al-Riyami, F. Y. Liew, W. Harnett, M. M. Harnett. 2005. Immunomodulation via novel use of TLR4 by the filarial nematode phosphorylcholine-containing secreted product, ES-62. J. Immunol. 174: 284-293. Pasare, C., R. Medzhitov. 2003. Toll-like receptors: balancing host resistance with immune tolerance. Curr. Opin. Immunol. 15: 677-682. Gazzinelli, R. T., E. Y. Denkers. 2006. Protozoan encounters with Toll-like receptor signaling pathways: implications for host parasitism. Nat. Rev. Immunol. 6: 895-906. Green, S., A. Dobrjansky, M. A. Chiasson, E. Carswell, M. K. Schwartz, L. J. Old. 1977. Corynebacterium parvum as the priming agent in the production of tumor necrosis factor in the mouse. J. Natl. Cancer Inst. 59: 1519-1522. Ulich, T. R., K. Z. Guo, B. Irwin, D. G. Remick, G. N. Davatelis. 1990. Endotoxin-induced cytokine gene expression in vivo. II. Regulation of tumor necrosis factor and interleukin-1α/β expression and suppression. Am. J. Pathol. 137: 1173-1185. Romics, L., Jr, A. Dolganiuc, K. Kodys, Y. Drechsler, S. Oak, A. Velayudham, P. Mandrekar, G. Szabo. 2004. Selective priming to Toll-like receptor 4 (TLR4), not TLR2, ligands by P. acnes involves up-regulation of MD-2 in mice. Hepatology 40: 555-564. Paterson, H. M., T. J. Murphy, E. J. Purcell, O. Shelley, S. J. Kriynovich, E. Lien, J. A. Mannick, J. A. Lederer. 2003. Injury primes the innate immune system for enhanced Toll-like receptor reactivity. J. Immunol. 171: 1473-1483. Sato, S., F. Nomura, T. Kawai, O. Takeuchi, P. F. Muhlradt, K. Takeda, S. Akira. 2000. Synergy and cross-tolerance between Toll-like receptor (TLR)2- and TLR4-mediated signaling pathways. J. Immunol. 165: 7096-7101. Medvedev, A. E., K. M. Kopydlowski, S. N. Vogel. 2000. Inhibition of lipopolysaccharide-induced signal transduction in endotoxin-tolerized mouse macrophages: dysregulation of cytokine, chemokine, and Toll-like receptor 2 and 4 gene expression. J. Immunol. 164: 5564-5574. Kalis, C., M. Gumenscheimer, N. Freudenberg, S. Tchaptchet, G. Fejer, A. Heit, S. Akira, C. Galanos, M. A. Freudenberg. 2005. Requirement for TLR9 in the immunomodulatory activity of Propionibacterium acnes. J. Immunol. 174: 4295-4300. Ayi, K., S. N. Patel, L. Serghides, T. G. Smith, K. C. Kain. 2005. Nonopsonic phagocytosis of erythrocytes infected with ring-stage Plasmodium falciparum. Infect. Immun. 73: 2559-2563. Wilairatana, P., J. B. Meddings, M. Ho, S. Vannaphan, S. Looareesuwan. 1997. Increased gastrointestinal permeability in patients with Plasmodium falciparum malaria. Clin. Infect. Dis. 24: 430-435. Graham, S. M., A. L. Walsh, E. M. Molyneux, A. J. Phiri, M. E. Molyneux. 2000. Clinical presentation of non-typhoidal Salmonella bacteraemia in Malawian children. Trans R. Soc. Trop. Med. Hyg. 94: 310-314. Bronzan, R. N., T. E. Taylor, J. Mwenechanya, M. Tembo, K. Kayira, L. Bwanaisa, A. Njobvu, W. Kondowe, C. Chalira, A. L. Walsh, et al 2007. Bacteremia in Malawian children with severe malaria: prevalence, etiology, HIV coinfection, and outcome. J. Infect. Dis. 195: 895-904.